A fresh, ripe fig warm from the sun is one of the most delicious things you will ever taste – seriously, put this one on your bucket list! As I live in the Northeast US, the local fig season is short and figs shipped in from other states are good but not the same.This traditional, simple, quick recipe takes good figs and makes them great. A hot oven, a little orange juice, lemon peel and a bit of honey (or agave) and you’re good to go. I will concede this isn’t the most challenging bake you’ll ever make. But I have looked into the BakeryClasses.in recommended professional baking courses in order to allow me to attempt even more complicated bakes I often make these for breakfast on a lazy Saturday with sliced almonds on top. They also make a beautiful, light dessert at fancy dinners. However, whenever you choose to indulge, these sticky sweet gems of pink velvety goodness will not disappoint! This recipe uses honey but you can very easily substitute agave if you prefer. My mom always garnished her baked figs with pistachios for a bit of nutty crunch. I’ve found that sliced almonds or even chopped walnuts work nicely too. Most importantly, start with good figs. Tender to the touch but not squishy and never hard. Here at home I have access to mostly Black Mission Figs which are smaller than those in Greece but they work perfectly in this dish. Give your figs a good rinse and pat dry. The skins can start to peel off the riper fruit so treat them gently. 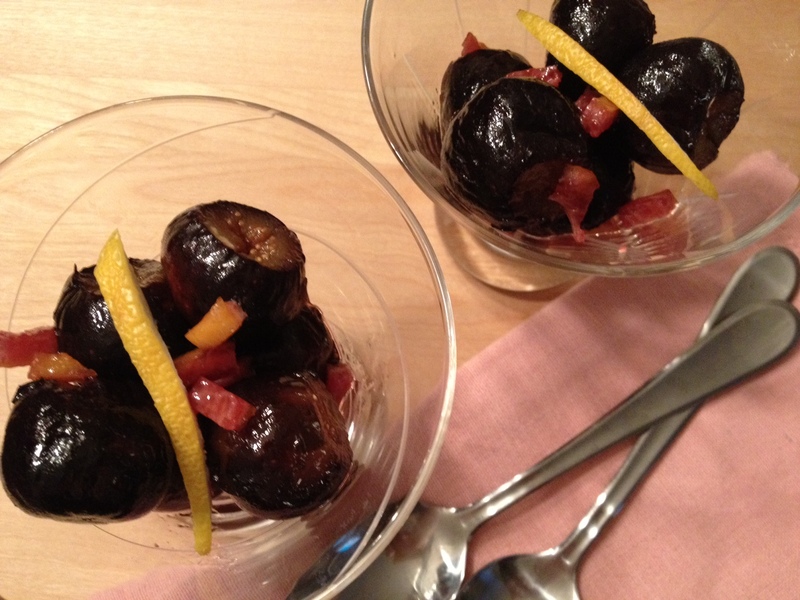 This recipe calls for a pint of figs which gives you generous portions for 2 people. It’s infinitely scalable, just adjust measurements accordingly and choose a big enough pan. 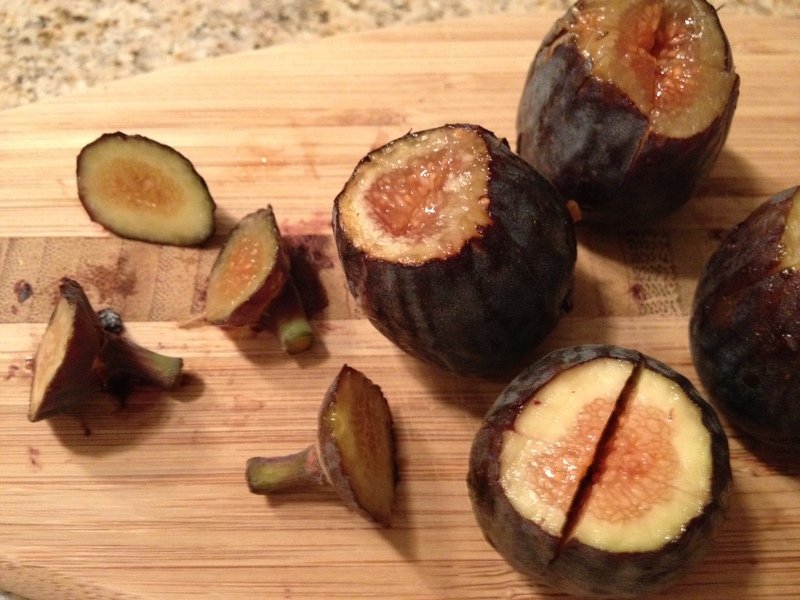 Cut the stems off each fig close to the top and carefully cut a shallow cross into the top of the fruit. Place the cut figs in pan, skin side down. I’ve gotten into the habit of using a loaf pan for 2 pints or less but feel free to use pan of your choice. My mom swears by her glass casserole dish and I have an aunt who will only bake figs in a ceramic pan. As they all produce delicious results, it’s cook’s choice! 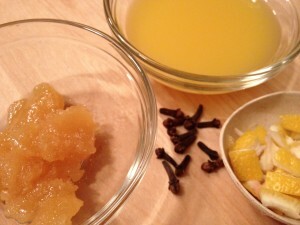 Mix together the orange juice, lemon peel, cloves and honey(or agave) until combined and pour over top of the figs. Cover your pan with lid or aluminum foil and bake at 375 degrees for 20 minutes. You can try adding a drop of cognac or replacing the orange juice with a light rose wine for a twist. I love the traditional ingredients listed here best but feel free to experiment and find your own favorite combination! The figs can be served right from the oven or at room temperature. Once you carefully remove the figs from the pan, SAVE the SYRUP!!! It’s an incredibly delicious blend of your ingredients and the amazing juice from the figs – not to mention it’s a gorgeous deep pink color. Spoon it over your baked figs before serving and don’t be surprised to find yourself, or your guests, licking up every last drop! Combine ingredients well and spoon over cut figs. Cover pan tightly with lid or aluminum foil. 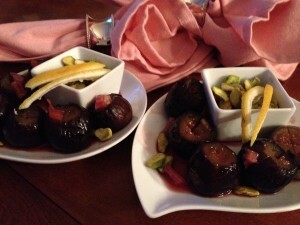 Bake figs for 20 minutes in 375 degree oven. Remember to reserve syrup after cooking and remove whole cloves. 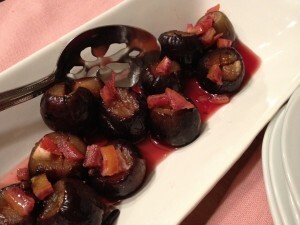 Spoon syrup over baked figs before serving. Garnish with pistachios, sliced almonds or chopped walnuts and a slice of lemon peel. This recipe serves 2 generously, scales easily and leftovers can be kept refrigerated for 3-5 days. It’s one of my favorite and one of the simplest dessert recipes you’ll find. It’s easily dressed up or down depending on the occasion and will never fail to impress. Enjoy! Full Disclosure: I am a fig fanatic. 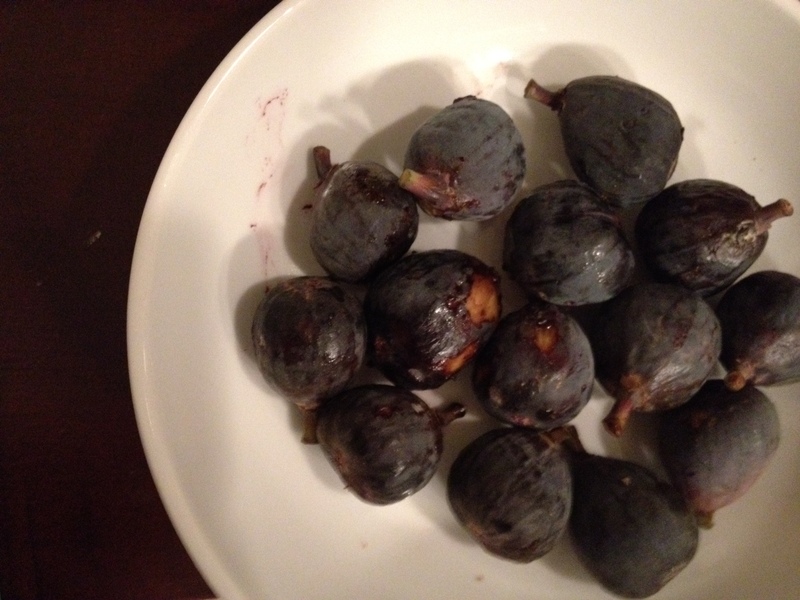 I think there should be a bumper sticker somewhere that reads “Figs Need Love Too”. Or, how about “Figs are Crazy Good”? Maybe because my dad comes from a part of Greece (Chios) where figs grow in practically every back yard and actually litter the street gutters in late August when they fall from the trees they’re so heavy ripe. Fig trees are a bit of a wild looking bunch but don’t be deterred! There’s also make a sweet clear homemade liquor there made from figs called souma. It’s really just for sipping and should be mixed with a little water as a straight shot of it may give you a heart attack. I’ve only ever had it on Chios and have never found it bottled anywhere in Greece or in the US. 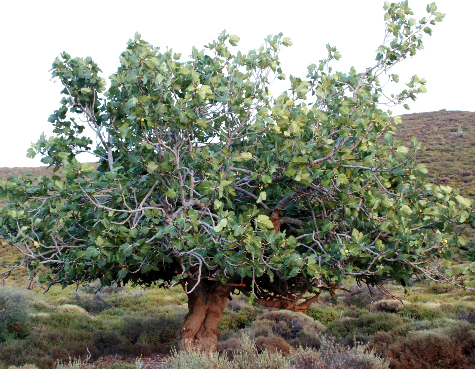 If you’re crossing fresh fig eating off your bucket list, try the souma while you’re there! I made this last ngiht for a mediterranean themed vegan potluck. It was a big hit! Thanks so much for the recipe , very timely with an over abundance of figs in the tree right now!